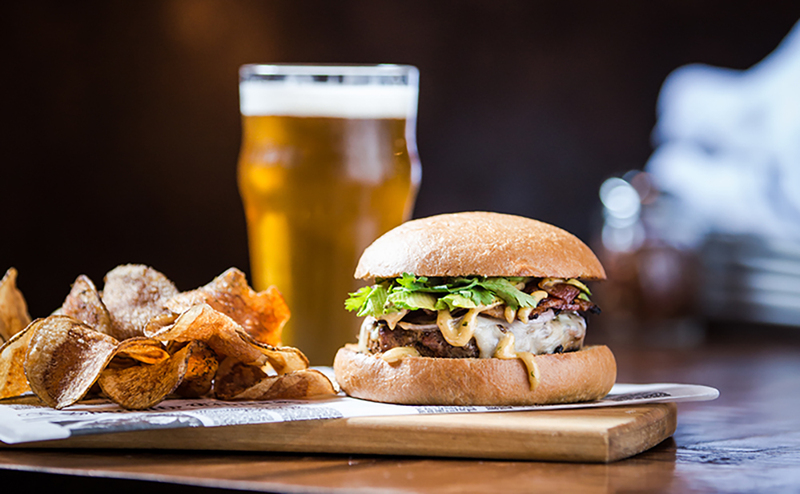 Come enjoy our famous Ayrshire Farms grass fed burgers and local beers. Then stay for the area's best live music every Friday and Saturday night. From house smoked wings to locally sourced salads and a rotating selection of craft brews, we've got something for everyone to enjoy. Kids need something to do? The adjoining arcade features video games, air hockey, skeeball, bowling and more. Enjoy views of Old Rag mountain and the Schoolhouse Nine Par 3 Golf course from our outdoor deck... where dogs are always welcome! House smoked pulled pork, refried beans, pico de gallo, cotija cheese and jalepenos. Yum. Tossed in sweet and sour sauce, lightly fried with peanuts and sesame seeds. Brined, house smoked, served naked. Fried sriracha macaroni and cheese balls. Fries topped with melted cheese, crispy bacon, green onions and sour cream. Side of srirancha or blue cheese. Add house smoked pulled pork for two dollars. Sunnyside Farm`s red wheat, hazelnuts, blue cheese whip, radicchio, pickled beets and orange vinaigrette. Seasonal greens, with nuts, seeds and your choice of dressing. Want some protein? Add grilled chicken, shrimp, chicken salad or burger. Cold soba noodles with seasonal veggies, ponzu and sweet chili glazed tofu. Tofu not your thing? Sub chicken or shrimp! Chili crusted shrimp, cornbread croutons, black beans, quest fresco, pickled onions, cilantro and pumpkin seeds. House smoked brisket, onions, peppers, horseradish cream, melty crack cheese. 1/2 lb Ayrshire ground pork, ham, bbq pork, bacon aioli, pickled jalapeños, aged cheddar on brioche bun. House smoked pulled pork topped with apple fennel slaw and homemade barbecue sauce. All natural curried chicken salad with grapes and apples on a croissant. Lettuce, tomato, onion and your choice of cheese. Cheddar cheese, house-made onion rings and chipotle mayo. Bacon, cheddar cheese, caramelized onions and BBQ sauce. Pimento cheese, dill pickles, bacon. Portobello mushroom, bleu cheese, miso mayo. Sunny egg, bacon, maple mustard. Hand breaded cod, tartar sauce, lemon, pickles and fries. Buttermilk fried chicken tossed in hot sauce on a waffle, Windsong honey, b&b pickles. White wine garlic sauce, bacon, smoked paprika, crispy grits. Open faced hot ham and cheese, sunny egg and cheese sauce. Check the Board for Rotating Beers on Tap!